PC Diagnostic Suite 2016 - A handy set of tools for diagnosis PC. It's just a convenient shell to run popular diagnostic programs, created in AMS. 2 useful vbs-script: for backup services and for Windows Assessment. 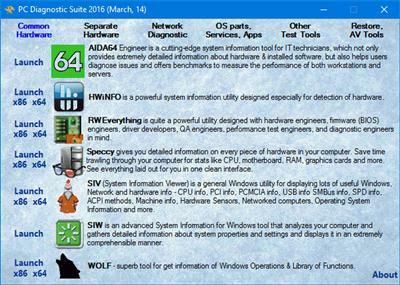 OSForensics Pro v3.3 build 10036 - added (new tool).